We got the chance to chat with Alice Landry, who moved to Scotland from England to run a B&B and is, in her own words: “living the dream”. Alice Landry first came to Scotland on holiday when she was just 13 years old. Originally from Derbyshire in England, Alice was immediately enamoured by what she saw when she crossed the border and dreamed of one day coming back to live and work here. Fast forward 20 years or so, and Alice is living proof that, if you work hard enough, dreams really can come true. Alice admits that she’d always liked the Scottish attitude towards life, and the warm and open welcome her and her family received when they visited. In fact, after living in various towns and cities across England and the rest of Europe throughout her life, she just knew that there was no place quite like Scotland for her. In July of 2017, Alice, her partner Jay and their two adorable children Autumn (7) and Sidney (2) moved from their home in Manchester to start a new life for themselves in Scotland. Leaving England behind, they’re now the proud landlords of a quaint bed & breakfast in the town of Kirkconnel in Dumfries & Galloway. Although the family had built a business and a life in Manchester, the lure of Scotland and the chance to enjoy a better work/life balance was too much to pass up. “We were very proud of our business, but it was incredibly hard work to keep it going and our work-life balance was completely wrong – when you start dreading every day, you know it’s time to make a change. 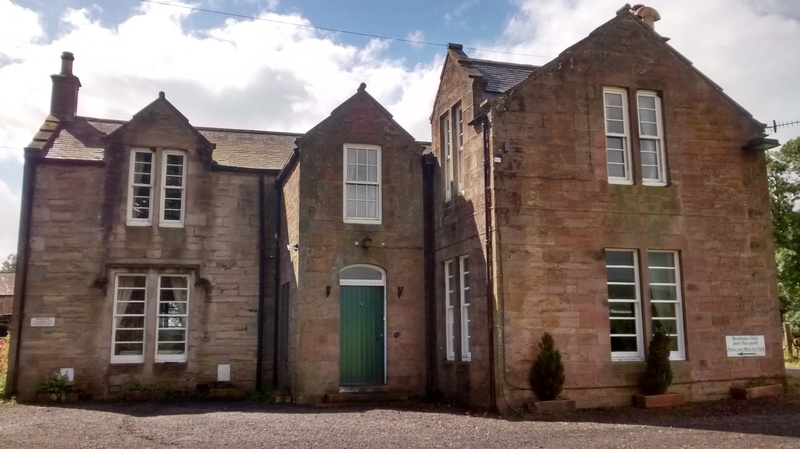 When the opportunity arose to run a B&B in Scotland we knew we couldn't let it slip by - there were just too many signs to ignore and we knew we were making the right decision for ourselves and our children”. Today Alice, Jay – and the kids – look after Rigg House, a glorious rural farmhouse in the heart of Dumfries and Galloway. The area is steeped in a wealth of interesting folklore and history, and Rigg House itself even has ties to one of Scotland’s most famous sons – Robert Burns. However, Alice is quick to point out that they somewhat lucked out on that front, and had no real idea of the area at all before they moved. The house was built around 1780 for local businessman, John Rigg, who moved to Scotland to run the nearby coal pits and wanted a stately home for his new wife to raise a family. In the years following the house’s construction, Rigg struck up an unlikely friendship with fellow local resident, Robert Burns. Hot on the heels of his international success, Burns had moved to the area to return to a life of farming. Rumour has it that when the two men met for the first time, Rigg was actually reading an edition of Burns’ poetry. Amazingly, in the nearly 250 years since it was built, the view that Rigg House guests enjoy today remains virtually unchanged from that the Rigg family would have experienced. Even Alice admits that the stunning views afforded by the surrounding area was definitely one of the biggest contributors to them picking this location to set up their new life. Stunning surroundings apart, Alice is also keen to highlight the many other benefits to living in Scotland. Many of these were things that she hadn’t even considered might be different when she first moved. Improvements in everything from quality of life and affordability, to first-class education and transport links meant that adapting to life in Scotland was easier than they imagined. “Manchester was becoming too expensive to live and trying to enjoy life was becoming a real battle for us. We knew what aspects of our life we needed to change in order to be happier and we were incredibly lucky to find somewhere that ticked all the boxes. […] It amazed us how much cheaper it was to live here, and yet it was really close to a good school and transport links were incredible! We have also found the healthcare here to be utterly outstanding in comparison to what we experienced in Manchester”. As much as setting up a successful business was incredibly important to Alice’s family, another thing that was equally important was ensuring her children had the right place to grow up. The aim was really to find somewhere to put down some roots and feel secure. What surprised Alice was that despite living in England for most of her life, Scotland already feels more like home, despite only being here 18 months. “I feel so much more secure and relaxed here compared to our old life. I think our children are very lucky to be having a childhood here. I guess because we enjoy life more now, we have more energy and time to spend on them. Family life is just so, so much better for us here. The contrast with our old life is simply immeasurable”. With more than 2.5 million visitors from all over the world coming to Scotland every single year, Alice, Jay and the team get an excellent opportunity to meet many different kinds of people. She says that while a large portion of her guests are folk who are on ancestry tours or people returning for family reunions in the area, there is an even more impressive number of folk like her, who just want to move here. In instances like this, Alice becomes almost like an ambassador for Scotland, helping people feel at ease and encouraging them by showing that they’re a perfect example of how it’s a great idea. Whether it’s offering advice on how to go about things, or just sharing her incredible passion for life in Scotland, Alice and the Landry’s just love welcoming people – a handy skill to have when you run a bed & breakfast. “Just do it! I can truly and honestly say that it is the best decision we’ve ever made and we have not for one second had any regrets. We’re less than an hour from Glasgow and less than two hours from Edinburgh so even though we live in a very rural location, we still have the delights of both cities close by”.